The wristwatches from Jaeger-LeCoultre's Master Control Collection have pure, elegant designs, making them perfect dress watches to add to your collection. Models with an alarm, calendar, or world time function are particularly practical timepieces. The Swiss luxury watch manufacturer Jaeger-LeCoultre presented the Master Control for the first time in 1992. It was their first wristwatch to undergo the then-new in-house testing process. Today, every Jaeger-LeCoultre timepiece must pass this test. Many other Swiss watch manufacturers rely on the Official Swiss Chronometer Testing Institute's chronometer test. Breitling, for example, sends every one of their movements to the COSC to be tested. At Jaeger-LeCoultre, however, the entire watch, rather that just the movement, is tested for its precision and resistance to pressure, shock, and magnetic fields. The test lasts more than 41 days, and this "1,000 hours control" process guarantees incredibly precise timepieces of the highest quality. How much do Master Control Collection watches cost? The Master Control Date is one of Jaeger-LeCoultre's entry-level models. It has an elegant, minimalistic design that focuses on the two most important functions: displaying the time and date. If you place high value on watches with more functionality, take a look at the Master Memovox with an alarm, the Master Calendar, or the Master Chronograph, which can be used as a timer. Lovers of thin watches will find their perfect watch in the Master Ultra Thin. If you're a fan of simple dress watches and have always wanted a JLC to call your own, the Jaeger-LeCoultre Master Control Date might be the right watch for you. Thanks to its simple design, the watch goes with almost every look. The current version has a 39-mm stainless steel or 18-karat pink gold case. The tapered dauphine hands and matching indices are very elegant. The date display is at three o'clock and Arabic numerals at six, nine, and 12 o'clock serve as hour markers, making it easier to read the time. The dial is available in black or silver or as a silver sector dial. A sector dial features two concentric circles inside and outside the hour and minute markers. Hour markers radiate out from the inner circle, dividing the dial into sectors. 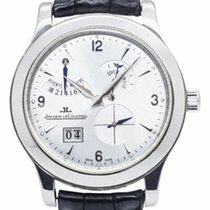 This unique design gives the JLC Master Control Date a retro look. The hands are skeletonized baton hands, meaning they'll never cover the date display. The band is available as an alligator leather strap or five-link stainless steel bracelet. Current models are powered by the automatic in-house caliber 899. It consists of 219 pieces and has a 38-hour power reserve as well as a solid gold winding rotor. If you view the movement through the sapphire glass case back with a magnifying glass, you'll be able to notice the perfect finishing on the individual components. Thanks to the balance frequency of 28,800 alternations per hour (A/h), the seconds hand smoothly glides forward. With a thickness of only 3.3 mm, the movement is incredibly thin. This enables the timepiece to also be thin; it's less than 9 mm thick. The Jaeger-LeCoultre Master Ultra Thin is even slimmer: It has a 41-mm case and is only 7.5-mm thick. Since this version only features an hour and minutes hand, it has a somewhat simpler look than the Master Control Date. 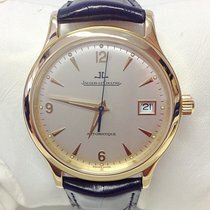 A pre-owned, well-maintained JLC Master Control with a date display costs less than 4,000 euros; new, it costs 4,500 euros. You should be prepared to spend around 11,000 euros on a new, 18-karat pink gold version. Jaeger-LeCoultre introduced the Memovox at the Basel Watch Fair in the early 1950s. The name of this early automatic watch with an alarm function roughly means "the voice of memory." But the Memovox doesn't only have an alarm function to wake you up in the morning, it also discreetly vibrates to remind you of appointments while it's on your wrist. If you set it down on a table or any other resonating body, its vibrations are more audible. A small hammer inside the watch is responsible for sounding the alarm. A characteristic feature of the Jaeger-LeCoutlre Memovox is the presence of two crowns on the right side of the case at two and four o'clock. The upper crown is used to wind the alarm's barrel as well as set the date and desired alarm time. The other crown winds the movement and sets the time. Since the caliber powering this movement, the caliber 956, is automatic, the movement's barrel is automatically wound while being worn. Once fully wound, the caliber will run for 45 hours. The Memovox is predominantly available in stainless steel or 18-karat pink gold. One highlight in this series is the limited edition stainless steel model with reference number 141848J. Limited to a run of 500 pieces, this retro watch with a blue dial has a design inspired by its 1970s predecessors and is thus a bit sportier than its siblings. Older retro watches were also the inspiration behind the luminous material on the hands and indices, making it easier to read the watch in the dark. This special, limited edition model has a list price of almost 11,000 euros. Pre-owned, stainless steel standard models are significantly more affordable. You should be prepared to spend at least 4,500 euros on a pre-owned watch in good condition, and 6,500 euros or more on a new watch. Prices for pre-owned gold watches start at 12,000 euros and rise to 14,000 euros for new gold timepieces. Chronograph fans will find what they're looking for in the Master Control Collection. The most distinctive feature of these chronographs is their tricompax layout. The Master Chronographs have the small seconds at six o'clock, the 12-hour counter at nine o'clock, and the 30-minute counter at three o'clock. The date display is located between the small seconds and the minute counter, and a tachymeter scale or pulsometer is featured on the edge of the dial. A tachymeter scale measures speed and a pulsometer, your pulse. The retro versions with sector dials have a somewhat different design; they only feature two subdials at nine and three o'clock. Jaeger-LeCoultre decided against a date display and small seconds for these models. As is the case with many standard chronographs, you can use the tachymeter scale to determine speed. This version also features blue skeletonized baton hands so that the markers on the subdials are easily legible. The automatic in-house caliber 751A powers this precise timer. Once fully wound, the watch's power reserve lasts an astounding 65 hours, making it possible to take your watch off Friday evening and put it back on Monday morning with it still running perfectly. Most chronographs in this series are made of stainless steel, though some are available in solid gold. Prices for a well-maintained, pre-owned Master Chronograph start around 5,500 euros, while new models cost around 6,500 euros. Pre-owned pink gold models cost about 13,000 euros; new they run for 16,500 euros. Business people often have to keep an eye on the time in various parts of the world – after all, you wouldn't want to wake up an important business partner with a phone call in the middle of the night. If you want to know the current time in any of the major time zones, the 24-time zone Master Geographic is the perfect Jaeger-LeCoultre timepiece for you. Using the second crown at ten o'clock, you can set the time for the second display. A display window at the bottom of the dial works in conjunction with a small arrow to indicate the second time zone you've chosen. The second time is displayed on a subdial above the six o'clock position. Another subdial at two o'clock displays the date with an incredibly practical feature: the quick-set date, which is controlled by an integrated push-piece at two o'clock. All you need is a thin object to press the push-piece to activate the function. Across from the date display is the retrograde power reserve display. Once the movement is fully wound, it lasts for 40 hours. The Master Geographic comes in stainless steel or pink gold; a steel variant with a sector dial and skeletonized baton hands is also available. Due to the lack of date and power reserve displays, this version has a particularly clean dial. Well-maintained and pre-owned stainless steel Master Geographics are available for around 5,000 euros; prices for pre-owned gold versions start at 8,000 euros. New stainless steel timepieces also cost around 8,000 euros and new gold versions cost around 16,000 euros.